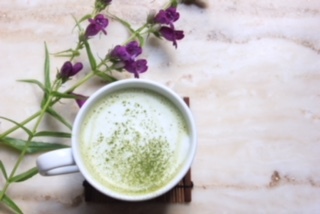 Wake up with a cup of warm matcha latte on a chilly morning. Jugetsudo’s matcha doux is sweetened with organic sugar so it’s super easy to use! One of our customers once said that the caffeine in coffee only keeps her energy level up for a bit, but then has less energy after drinking it. Matcha, on the other hand, keeps her going and able to focus for the rest of the day. Place the matcha doux in a cup. Slowly whisk in hot water and whisk well with a small whisk.